The name challah may originally have indicated roundness ("circle") and then also came to denote hollowness ("space") or vice versa. The bread was originally called Yachov in Hebrew, since it was baked in the form of a round loaf. It is also now known as cholla bread. Yiddish communities in different regions of Europe called the bread khale, berkhes or barches, bukhte, dacher, kitke, koylatch or koilitsh, or shtritsl. Some of these names are still in use today, such as kitke in South Africa. Most traditional Ashkenazi challah recipes use numerous eggs, fine white flour, water, sugar, yeast, and salt, but "water challah" made without eggs also exists. Modern recipes may replace white flour with whole wheat and oat or sugar with honey or molasses. Among Sephardic Jews, water challah is preferred for ritual purposes because Sephardic minhag does not require the Mitzvah of Challah if the dough contains eggs or sugar. While breads very similar to Ashkenazi egg challah are found in Sephardic cuisine, they are typically not referred to as challah but considered variants of regional breads like çörek, that are eaten by Jews and non-Jews alike. Egg challot sometimes also contain raisins and/or saffron. After the first rising, the dough is rolled into rope-shaped pieces which are braided, though local (hands in Lithuania, fish or hands in Tunisia) and seasonal (round, sometimes with a bird's head in the center) varieties also exist. 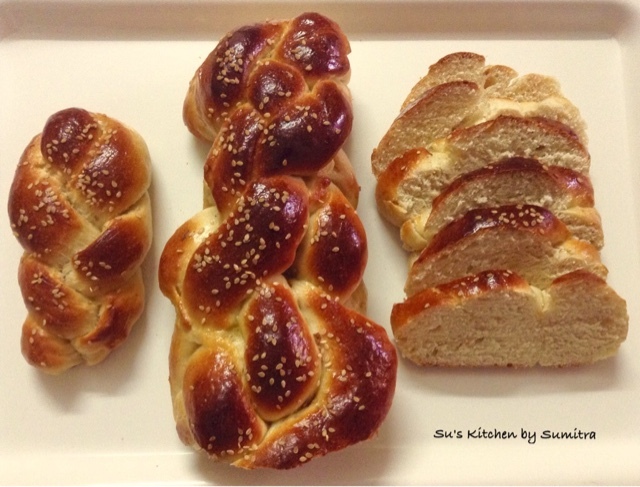 Poppy or sesame (Ashkenazi) and anise or sesame (Sephardic) seeds may be added to the dough or sprinkled on top. Both egg and water challah are usually brushed with an egg wash before baking to add a golden sheen. According to Jewish tradition, the three Sabbath meals (Friday night, Saturday lunch, and Saturday late afternoon) and two holiday meals (one at night and lunch the following day) each begin with two complete loaves of bread. This "double loaf" commemorates the manna that fell from the heavens when the Israelites wandered in the desert for forty years after the Exodus from Egypt according to Jewish religious belief. The manna did not fall on Sabbath or holidays; instead, a double portion would fall the day before the holiday or sabbath. Each single loaf is sometimes woven with six strands. Together, both loaves have twelve which is associated with the 12 Loaves of the Showbread offering which was displayed in the Holy Temple (in Jerusalem)- on the "Table", each loaf represent a tribe of Israel. Other numbers of strands commonly used are three, five and seven. Occasionally twelve are used, referred to as a "Twelve Tribes" challah. Here I have replaced water with milk. Mix the yeast and 1 tbsp of sugar in the lukewarm water. Keep it aside until it rises. Add the eggs in the yeast water and mix it thoroughly. In a large mixing bowl, add the remaining 1/4 cup sugar, flour, and salt. Mix it with a wooden spoon and pour in the yeast mixture and oil. Stir until the dough starts to come together, then knead for 10 minutes, or until the dough is soft and stretchable. Sprinkle some flour and apply some oil on the palm as the dough may be little sticky while kneading. Let it rise in a warm place until doubled in size. Grease a baking sheet. Take the dough, punch it. Knead it for 2 minutes. Divide the dough into 6 portions. 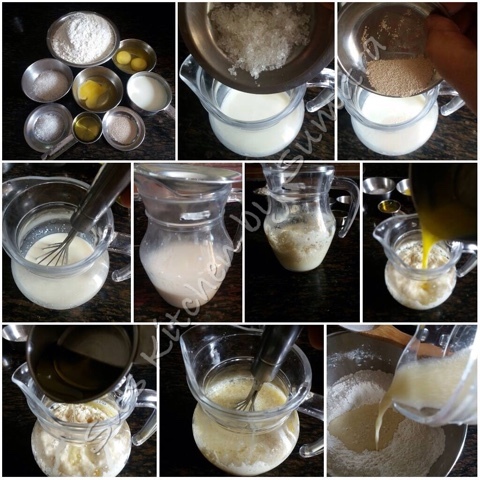 Weight each portion, so it is divided equally approximately 125 grams. Take a portion and roll it into a long rope. Repeat it with the other portions. 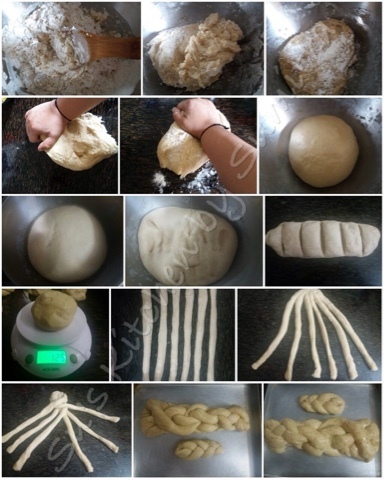 Arrange the dough ropes in a line. Pinch the top of the ropes together and start braiding the ropes together. As the braiding is done, pinch the end so that it does not open up. Place it on the baking sheet, cover, and let it rise. 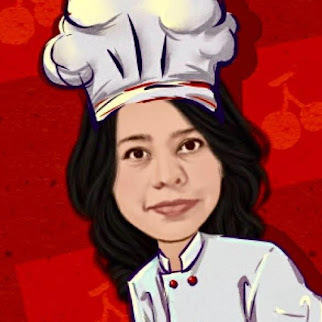 As the dough is rising, preheat the oven to 180 degrees celcius. Brush with the egg wash. Sprinkle sesame seeds and bake for 30- 35 minutes, or until the challah is golden brown.